With the increasing importance and popularization of GIS, experts from domains require more GIS capabilities and expect that the applied software equip with more powerful and practical functions in data analyzing. Therefore, the geographic statistical methods that include capabilities of spatial analyzing and estimating has been added to GIS to assist users in comprehending the variation and dependence of spatial data and estimate the value of unsampled points. SuperGIS Spatial Statistical Analyst 3.0, an extension which works with SuperGIS Desktop 3.1, integrates geographic statistical analysis methods and enables users to investigate spatial data, to query and display attribute data and to manipulate basic statistics in GIS. Furthermore, adopting geographic statistical analysis methods to analyze spatial data, SuperGIS Spatial Statistical Analyst 3.0 helps users to realize the variation and dependence of spatial data, so that the capability of assisting spatial data analysis and decision making can be enhanced as well. Enable users to apply basic statistics on the sample data, including the sample count, average, maximum, minimum,Enable users to apply basic statistics on the sample data, including the sample count, average, maximum, minimum, quartile, variance, standard deviation, skewness coefficient, variance coefficient, kurtosis coefficient and so forth. Enable users to view the data distribution interval based on Divide or Interval. Enable users to conduct semivariance analysis and covariance analysis.Enable users to conduct semivariance analysis and covariance analysis. Enable users to draw and analyze semivariogram and covariogram. Provide users with various models for model fitting, such as Spherical model, Exponential model, Gaussianmodel and so on. Allows users to modify three types of variogram parameters: Nugget, Sill and Range. Provide users with parameters which are used to set searching direction and enable users to conduct variance analysis on data in different directions. The types of parameters include Direction, Tolerance, Bandwidth and so forth. Various Krigings are provided: Ordinary Kriging, Universal Kriging, Simple Kriging, Co-Kriging and Indicator Kriging, etc. Provide Cross-validation function which enables users to view value distribution after estimating via cross-validation graph and Measure value, Prediction value and Error value of the paired point data. 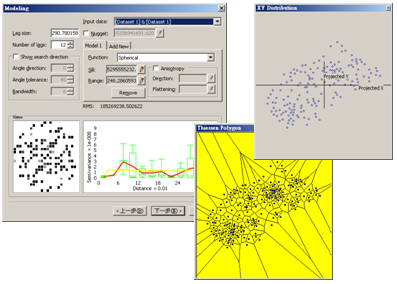 Via Cross-validation function, users are able to calculate the sample data and then obtain linear regression equation and linear regression graph. In the property page of the results of Kriging analysis, users are allowed to set graduated color, layer displayIn the property page of the results of Kriging analysis, users are allowed to set graduated color, layer displaysettings and hillshade settings. Hillshade settings support users to set the scale of Z axis, Azimuth and altitude. Results of raster calculation can be exported as image files (SGR or LAN). In addition, users are able to set raster size to fit their requirements. Spatial statistics now is widely applied in diverse domains, including sociology and natural science. SuperGIS Spatial Statistical Analyst 3.0, the extension which enables experts form domains to conduct spatial statistic analysis to enhance GIS capability in decision making, is going to be launched in Q4 2012.